William Lawrence Swindle, eldest son of pioneer settlers James Swindle and Nancy Jane Parker, was born and raised in the Ray’s Mill district of Berrien County, GA. He owned property and resided at Ray City, and also at Nashville, GA.
W. L. Swindle was a Mason, and in politics he was a democrat. He was elected to three terms as Sheriff of Berrien County, after which the Nashville Herald announced February 4, 1911, “Mr. W.L. Swindle, of Nashville, has accepted a position with his brother, Mr. J.S. Swindle, of this place [Ray’s Mill – now Ray City].” Another of his brother’s, George Emory Swindle, died of Bright’s disease in 1909. Family of William Lawrence Swindle, circa 1900. 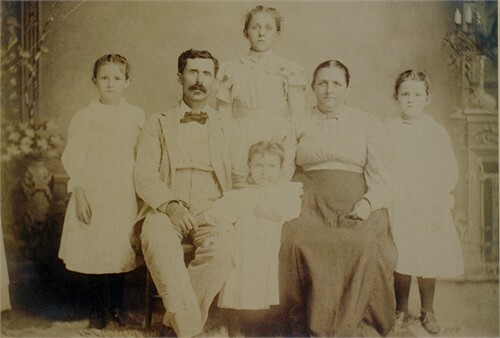 Left to Right: May Ola Swindle, William Lawrence Swindle, Ada Belle (standing,rear), Callie Etta Swindle (center, front), Polly Nesmith Swindle, Emma Lee Swindle. Image source: Cher Newell. Ex-Sheriff W. L. Swindle of Berrien County was stricken with paralysis Friday about noon while he was in the courthouse at Nashville. His entire left side was affected. His daughter, Mrs. C.C. Hall was notified and together with Col. Hall left for Nashville Saturday morning. Later advices from Mr. Swindle says that he shows but little improvement although he is able to take liquid nourishment. News was received in Tifton with deep regret Saturday morning that former Sheriff William Lawrence Swindle died at his home in Nashville Friday night at 9 o’clock. Mr. Swindle had been in bad health for several years and last year suffered a stroke of paralysis. He was taken seriously ill early in the week and his daughter here was summoned to his bedside. Mr. Swindle was about fifty-eight years old and was born and raised in the Ray’s Mill section of Berrien county. He was a son of James A. and Nancy Swindle and his father died last year. 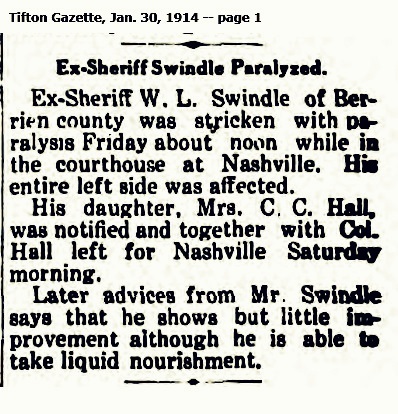 Mr. Swindle was for some time in the mercantile business at Nashville and served Berrien county as Sheriff for three terms, making an able and zealous officer. Mr. Swindle was married twice. His first wife died several years ago and one son born to them died in early manhood. His second wife was Miss Collie Nesmith. To this union four children, all girls, were born. One, Miss Emmie, is dead, and three are living, Mrs. C. C. Hall, of Tifton, and Misses May and Callie Swindle, who are with their mother at the family homestead. The funeral services were held at Nashville Saturday afternoon. Among those attending from Tifton were Sheriff Shaw, who was formerly Deputy Sheriff under Mr. Swindle, and Mr. W. E. Webb. 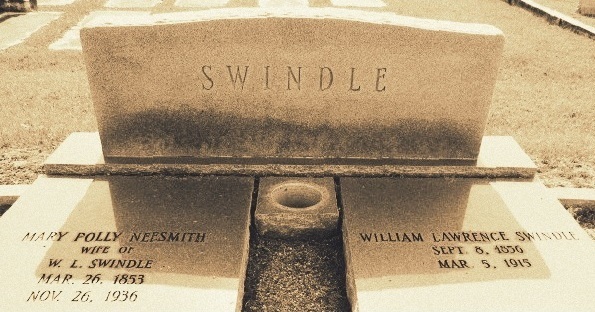 Mr. Swindle was a Mason, a firm and loyal friend and a man who had many excellent traits of character. He was well liked here where he had an extensive acquaintance. This district which was then in Berrien county, contributed a strong vote towards his election each time he was a candidate. Ada Bell Swindle. Birth July 2, 1886 in Berrien Co., GA. Married Christopher Columbus Hall in 1904. Death January 16, 1941 in Washington, DC. May Ola Swindle. Birth May 6, 1888 in Berrien Co., GA.
Emily Swindle. Birth April 6, 1890 in Berrien, GA. Died of Typhoid Fever July 9, 1904 in Berrien County, GA.
Callie Etta Swindle. Birth August 14, 1894 in Berrien County, GA. Married Walter Jordan Adams. Death July 27, 1977 in Berrien Co., GA.